Oceanus (pron. : /oʊˈsiːənəs/; Ancient Greek: Ὠκεανός (Ōkeanós); pronounced [ɔːkeanós]) was a pseudo-geographical feature in classical antiquity, believed by the ancient Greeks and Romans to be the divine personification of the World Ocean, an enormous river encircling the world. Strictly speaking, Oceanus was the ocean-stream at the Equator in which floated the habitable hemisphere (οἰκουμένη, oikoumene). In Greek mythology, this world-ocean was personified as a Titan, a son of Uranus and Gaea. In Hellenistic and Roman mosaics, this Titan was often depicted as having the upper body of a muscular man with a long beard and horns (often represented as the claws of a crab) and the lower body of a serpent (cf. Typhon). On a fragmentary archaic vessel of circa 580 BC (British Museum 1971.11-1.1), among the gods arriving at the wedding of Peleus and the sea-nymph Thetis, is a fish-tailed Oceanus, with a fish in one hand and a serpent in the other, gifts of bounty and prophecy. In Roman mosaics, such as that from Bardo (illustration below) he might carry a steering-oar and cradle a ship. In most variations of the war between the Titans and the Olympians, or Titanomachy, Oceanus, along with Prometheus and Themis, did not take the side of his fellow Titans against the Olympians, but instead withdrew from the conflict. 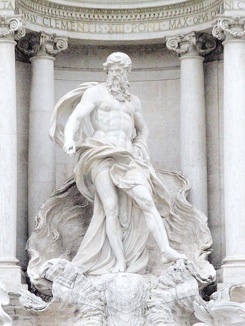 In most variations of this myth, Oceanus also refused to side with Kronos in the latter's revolt against their father, Ouranos.